You’ve all seen or heard this one. I only wish I’d said or written it, but not so lucky, I guess. There probably are versatile dogs that come out of the womb “finished,” but I’ve never met one and likely never will – I own wirehairs. NAVHDA sees the occasional year-old or younger pup passing a utility test; AKC probably does as well. I doubt American Field or NSTRA have many, either – the demands of preparation for high-level performance are simply not conducive to a pup’s bones and joints, let alone his intellect. What that pup has been through to get to that point, we’ll never know. Maybe it all came naturally, but I’d suspect a lot of pressure and a less-than-ideal puppyhood, where the life-long bond between man and dog is supposed to be created … a connection based on trust, respect, measured tolerance of a young dog’s abilities and human’s expectations. If you have a savant puppy who does it all, congratulations. You are among the storied few. I can’t wait to read your post and see your test results. If you aren’t in possession of a super-pup, welcome to my world. I bring this up and scrape it off my chest because yesterday I was reminded – again – of a concept called “place learning.” Most have heard of, or experienced, the phenomenon: a pup is an all-star at recall … heeling … steadiness, when you’re on the training table or next to the big pine in your yard. Move to the small rhododendron or beyond the gate, and it’s as if you’re speaking a foreign language. I’m saying this as a reminder to myself. If you benefit, all the better. From now on, in all skills, at all levels, the “baby steps” of progression will include geography: From the front walk, to the grass next to the front walk. From the front yard to the back yard, from the yard, to the driveway next to the yard, yada, yada, yada. Professional trainers often suggest a dog hasn’t mastered a skill until he performs it flawlessly in seven places. With me and Flick, it will be a hundred and seven. Thanks Scott for your work. Heres a story for you…………..
Susie ( my wife) and I took close to a two week vacation in February and visited Georgia and North Carolina. The Brit ( a friend) stayed on and off at the house and took care of our two English setters, Ace and Willow and our cat Jet. We’ve tried a number of occasions to use Ace for breeding purposes however determined, concluded he was sterile. Well that happened to be not true. When we were gone we believe the Brit poured wine into the dogs dishes and nature took its course. Yesterday evening I fielded a call from Susie saying Willow had disappeared. I searched for her from dusk till 2:30 in the morning I discovered no evidence of a Timber Wolf having dragged her off the property ( which is one of my biggest fears ) nor evidence she broke through the invisible fence system. I was stymied. The next morning I let Ace out of the house to go to the bathroom and a few minutes later I tried to whistle Ace back in and Willow showed up in our yard. Confusion and happiness collided and I followed her tracks backwards to our south porch. Susie heard pups crying. Willow has given birth to 6 pups in a crawl space under our porch. We had to dismantle a wall to retrieve them. I thought Willow was getting a little heavy but aren’t we all .. this time of year. She is the daughter of Ridge Creek Cody , and my understanding is he mostly dominated the North American Open ( all pointer breeds ) Field Trial world until his un-timely death while being conditioned in North Dakota a few summers back. I was hesitant to purchase her because of my age , afraid I could not handle her big runs , and worried my owning her was a disservice to her as I am often to busy showing real estate on the weekends to field trial her. Father………This is a photo of Ace. He also has an extensive field trialing history in his family. Ace is the son of Magic Rocky Balboa a National Wild Bird ( ruffed grouse ) champion. Magic Rocky Balboa was owned by Jerry Kolters kennel in Chisago County Mn. ( Northwoods Bird Dogs) I’d have to look in Aces file he may have some hunt-test titles but has never been field trialed . Ace also has hunted seven or eight US states and one Canadian province. 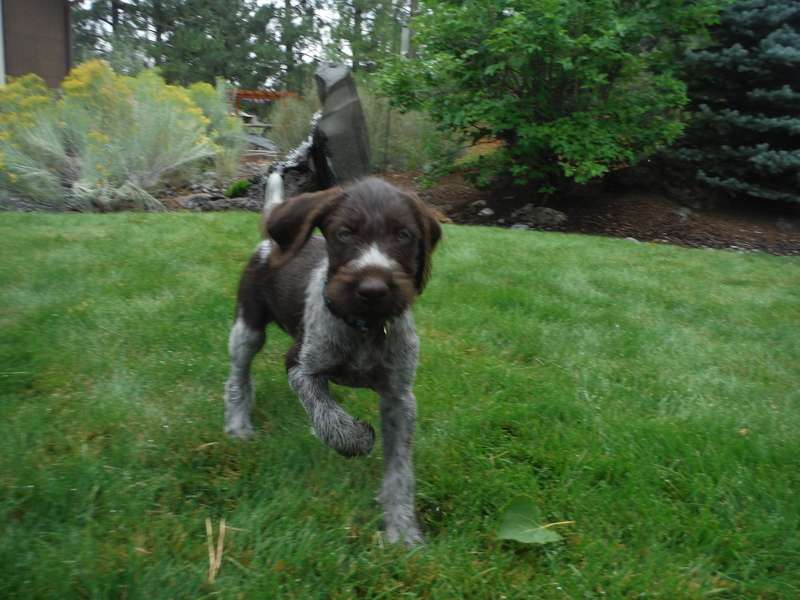 He is an incredible wild bird pointer ( heavy emphasis on ruffed grouse) and he also retrieves like a labrador. Thanks Bill and congratulations on the new arrivals! Great stuff.